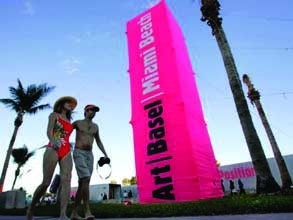 A month later, from January 13th to the 16th, the Miami International Art Fair 2012 will be taking place. Having débuted in 2010, MIA has quickly become a contemporary art fair that draws thousands of visitors and VIPs. According to the fair’s website “MIA features contemporary art of all media, including photography, installations and video. The fair also integrates innovative educational art projects – linked to important museums and other art-related organizations. An array of vibrant social activities attract collectors from throughout the US, Latin America and Europe.” Visit mia-artfair.com for more information. If you plan on visiting Miami this winter–whether for art or sun, parties or leisure–you’ll want to take a look at the array of miami luxury villa rentals on offer. Villazzo’s VillaHotel luxury villa rentals have all the perks of a hotel, including concierge and butler services, with all the opulence and privacy of your own home. The features of the 11,000 sq ft (1,022 m2) Spanish Colonial style Villazzo VillaHotel Contenta on Palm Island include a private dock, floating deck, dining terrace with bar, an enormous heated walk-in pool, a swim-in grotto and waterfall, as well as as a private dock and gym. The clean lines and contemporary design of Villazzo’s VillaHotel Valentina is a perfect companion to the stunning views of the Miami bay that the house offers. Six bedrooms, six bathrooms and a vanishing-edge pool are only the tip of the iceberg when it comes to what this luxury villa rental offers. Located in the exclusive gated community of Sunset Island, the Villazzo VillaHotel Jasmine is dripping in Moorish style and exotic charm. Highlights of this luxury villa rental include the rooftop Jacuzzi, an in-home cinema and an office integrated into the bar. The Villazzo “V” Villa Julia luxury villa rental in Miami Beach is a five bedroom, five bathroom bayside property that offers not only beauty but privacy. The villa’s multi-level terrace as well as a vanishing edge pool with cascading waterfall, barbecue area, and bayside dock make this property an unforgettable place to spend your Miami vacation. These are just a few of the gorgeous VillaHotel and V Villa Miami options offered by Villazzo. Take a closer look at all our luxury villa rentals and start planning your trip to Miami now! This entry was posted on Sunday, June 19th, 2011 at 1:14 pm	and is filed under Luxury Travel, Miami Beach Luxury Travel, Nightlife. You can follow any responses to this entry through the RSS 2.0 feed. You can leave a response, or trackback from your own site.